While everyone knows we’re about to have a battle of the God Squad, with Daryl vs Darryl (Ward vs Fairchild) there are others running petitions right now. Now, of course, there is always the barrier of the Montgomery County Board of (S)Elections which has an uncanny ability to disqualify candidates for all kinds of reasons. The petitions are broken- as is the process. Donald Domenick who has turned in petitions before and been disqualified is suggesting he’s running. 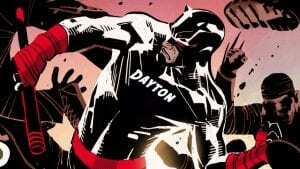 He’s the head of the Black Panther Party in Dayton. Lauren White who owns Indigo Life Media and the Nucleus Co-share space on E. Fifth in the Oregon District has supposedly been hustling a petition in East Dayton. She’s got her own marketing firm- and social media chops. added 27 Feb: Abraham Sandy, 19, who is a student at Stivers and head of the Dayton Republican Club, and co-chairman in Montgomery County of the Mike Gibbons for United States Senate campaign. If you have anyone else come by with a petition- please, add their name in comments. Special Elections like this one for Joey Williams seat are considered the best chance of getting elected to the Commission. It was the magic for Dean Lovelace after 2 previous failed attempts. And, no, I’m not running. 2 lawsuits, a Service Disabled Veteran who is going to need my help as he re-enters the community, my mother, and a big VA contract for my business are all tops on the list. I’ve also got to make sure I win my precinct captaincy to help overthrow the Monarchy of Montgomery County. Let the petition failures be few, and the choices good. Abraham Sandy, 19, who is a student at Stivers and head of the Dayton Republican Club, and co-chairman in Montgomery County of the Mike Gibbons for United States Senate campaign will be seeking signatures. He will be having 5-10 people help him in the next week and a half to gather signatures. It looks as though Abraham Sandy’s team will possibly be able to collect 600 by the end of Tuesday. Thus best case scenario have a 50 percent chance to get on the ballot. Lauren White has dropped out of seeking signatures. Abraham Sandy has decided to focus his efforts on the Mike Gibbons for U.S. Senate campaign in Montgomery County.